Day 2: Your Favorite Delicious Christmas Dessert–With Recipe! Every year for Christmas, we make an assortment of cookies, fudges, candy, etc. It is a tradition that we do as a family, everyone gets involved and usually ends up covered in flour :). We keep some, some goes to work with Bryan and we take a basket of goodies to the SF’s (Air Force police) working the gate after Christmas Eve service. Normally my fav would be the white chocolate cranberry fudge, but last year I tried a new recipe…butter toffee with sea salt topping. Oh my gracious….absolutely divine! The perfect mix of rich, sweet, salty, crunchy…yum. I originally found the recipe on Pioneer Woman’s blog here. 16 ounces, weight Chopped Topping: Toasted Nuts, Candy Canes, Sea Salt, Etc. Combine butter, sugar, water, and salt in a saucepan. Bring to a boil, stirring constantly. Cook over moderate heat, stirring gently, until candy thermometer registers 298 degrees. Pour the mixture onto a silicone baking mat or good parchment paper. Use a heatproof rubber spatula or offset spatula to spread quickly before the toffee sets. Spread thin. Allow toffee to cool completely. Blot to remove excess oil from the surface. 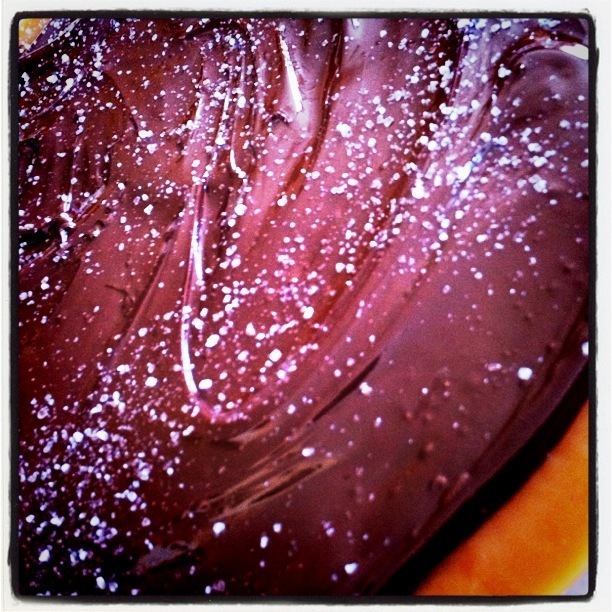 Coat surface with half of the melted chocolate and immediately sprinkle with topping. When chocolate has totally set, carefully flip over (it’s okay if it falls apart a bit) and coat other side with the rest of the chocolate. Sprinkle on topping. Interesting! I don’t think I have ever tried toffee before. This looks really good. Thanks for sharing and love your blog!